After more than 10 years of planning, Philadelphia is taking the first steps in transforming an abandoned, overgrown rail line that cuts through the heart of the city into a lush and lively public park. Officials broke ground last month on the first phase of the Rail Park, the City of Brotherly Love’s answer to New York City’s High Line. The first section starts in the gritty, post-industrial neighborhood called Callowhill, where a quarter-mile ruin of the former Reading Viaduct will become a walkable, elevated oasis. “It’s going to completely change this area, if it actually happens,” said Alex George, 33, who rents an apartment one street away. He said the park has been talked about for so long, it’s developed the air of myth. “The locals around here see it as a legend, something put in our faces as a way to raise rents,” he said. This time, it’s real. Democratic Gov. 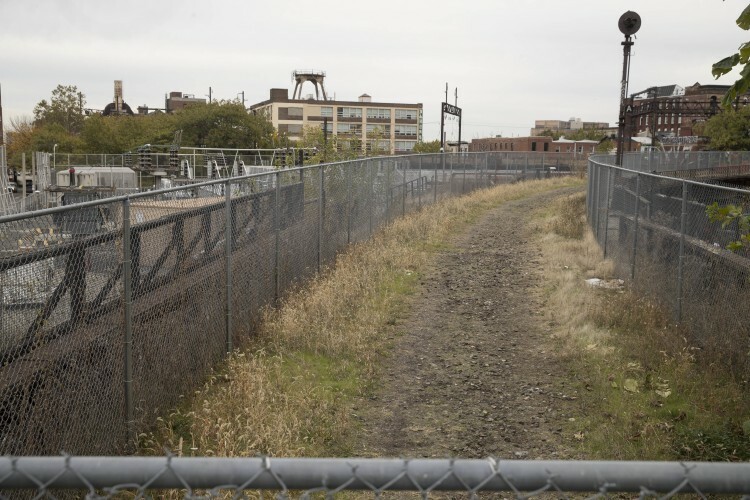 Tom Wolf announced a $3.5 million grant for the viaduct section of the Rail Park in September, allowing construction to begin before the end of the year. Other funding for the $10.3 million project comes from the city, foundations and donations. Plans call for the Rail Park to eventually span 3 miles, traversing the center of Philadelphia via former Reading Railroad tunnels, rail cuts below street level and elevated platforms. The park would be steps from major cultural institutions like the Philadelphia Museum of Art and pass through the Community College of Philadelphia’s campus in a seamless link of 10 distinct neighborhoods. But only the quarter-mile stretch of the viaduct has funding so far. New York City’s High Line – a 22-block elevated park – has helped transform neighborhoods on Manhattan’s West Side. Luxury condos, galleries, restaurants and boutiques have all but pushed out the industrial grime around the old freight route. Proponents of Philadelphia’s plan envision a similar – if less glitzy – effect. “The High Line is a Mercedes-Benz of a park, and we don’t have people here with that deep of pockets,” said Paul Levy, of the Center City District, a business improvement organization managing the first phase. The first two sections of the High Line cost about $150 million; the third section costs about $35 million. Bustling Chinatown is a few blocks south of the viaduct, and some community leaders say they feel left out of the planning process. The Philadelphia Chinatown Development Corporation had previously called for tearing down the viaduct to make way for affordable housing, said Sarah Yeung, the organization’s director of planning. Chinatown desperately needs public space, she said, but residents also need affordable housing options, something that will be harder to come by if the park succeeds and rents rise. “It’s important that the city and Center City District realize it’s not just a park – it has a wide-ranging impact on the local community here,” she said. Levy said his group supports the creation of affordable housing surrounding the park. A number of U.S. cities have turned obsolete infrastructure into amenities in recent years. In Chicago, there’s the Bloomingdale Trail – referred to as “the 606” by locals – an abandoned railway line transformed into an undulating park. Dallas built a deck over a freeway to create Klyde Warren Park. Virginia Beach, Va., turned a landfill into an expanse of lakes, hills, playgrounds and a skate park that it playfully calls Mount Trashmore.